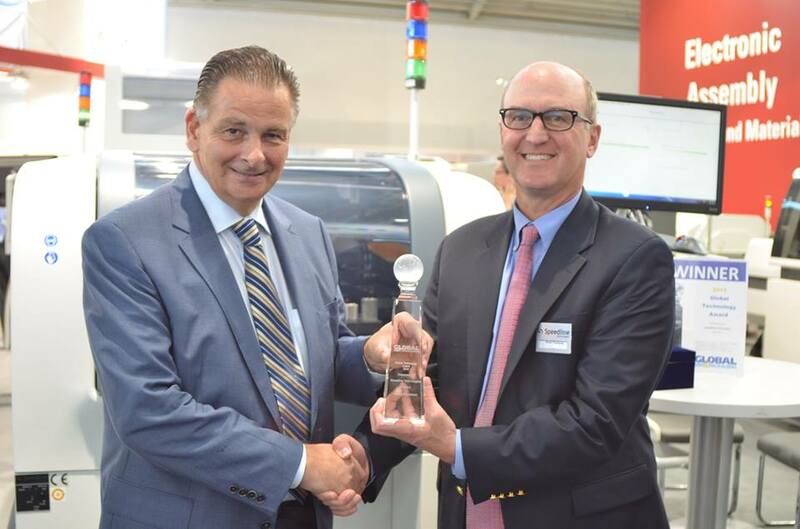 Franklin, Massachusetts, USA Speedline Technologies’ new MPM Edison printer has taken a coveted Global Technology Award. The award was presented to Speedline Technologies’ Mark Clemons, Business Unit Manager Printers, during a ceremony on Tuesday, Nov. 10, 2015 that took place at the Messe München exhibition center in Munich, Germany during Productronica. The Global Technology Awards program is an annual celebration of product excellence in electronics surface mount (SMT) assembly. Premier products based on the finest examples of creative advancement in technology are chosen by a distinguished panel of industry experts. The MPM Edison is an innovative new platform of next-generation printers sharing software, controls, and advanced technologies on a scalable platform. Featuring outstanding speed, accuracy, and performance surpassing best-in-class SMT printers worldwide, Edison is built to excel in every way, with patented features throughout its design. Edison operates at twice the speed and 25% higher accuracy than current printers, and delivers an unheard-of higher throughput than competitive printers 15 seconds total throughput, including printing and stencil wipe cycle. Edison delivers double the throughput of best-in-class printers worldwide. Edison features built-in 8 micron alignment, and 15 micron wet print repeatability (>2 Cpk @ 6σ) proven through 3rd party Print Capability Analysis (PCA) testing. This represents a 25% improvement in wet print accuracy over current best-in-class printing machines. Edison performs superbly with SMT Fine Pitch solder paste printing for small apertures (<.3mm CSP’s, 01005’s), and Edison is powered by an intuitive, new software operating system, Intueri, that’s easy to set up and use. For more information about Edison, visit Speedline Technologies.